For many, the economic benefits accruing from the UK’s membership of the EU are self-evident and unanswerable: access to the European Single Market is of enormous benefit to British exporters and a major attraction for global investors looking to expand into the region. Or so the argument goes. But where is the evidence for this? What do the trade and investment figures actually tell us? When a government minister told parliament that EU members traded twice as much with each other as they would do in the absence of the Single Market, Michael Burrage set out to test the veracity of the assertion. Here he relates his painstaking quest for the facts, studying first the documents on which the minister’s claim was based and then, finding scant evidence there, conducting his own analysis of the data. This timely study looks behind the claims that are frequently made in support of the EU and finds a very different reality. 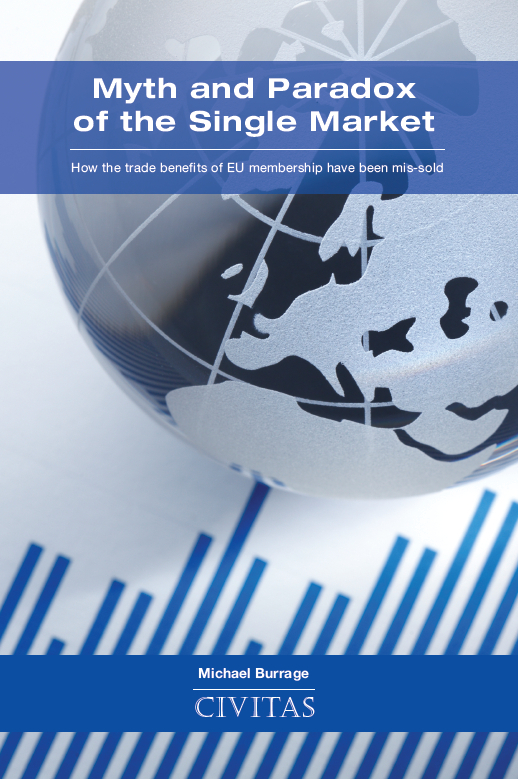 Examining the research used by not only ministers but big business and many other pro-EU lobbyists to support their stance, Burrage finds that there is no empirical basis for the supposed advantages that the Single Market confers on the British economy. It is a devastating conclusion that should fundamentally shift the terms of the debate surrounding Britain’s relationship with the EU. ‘The main aim of governments has been to ensure that membership of the EU is seen as a prized asset, which the UK must not let slip from its grasp. This has resulted in a mis-selling of the trade benefits of the Single Market comparable in some respects to the mis-selling of payment protection insurance, though on a larger scale, over a longer period, and with far more serious consequences. Michael Burrage is a director of Cimigo, which is based in Ho Chi Minh City, Vietnam, and conducts market and corporate strategy research in China, India and 12 countries in the Asia Pacific region. He is also a founder director of a start-up specialist telecom company which provides the free telephone interpreter service for aid workers and others where interpreters are scarce. He is a sociologist by training, was a Fulbright scholar at the University of Pennsylvania, has been a lecturer at the London School of Economics and at the Institute of United States Studies, specialising in the comparative analysis of industrial enterprise and professional institutions. He has been a research fellow at Harvard, at the Swedish Collegium of Advanced Study, Uppsala, at the Free University of Berlin, and at the Center for Higher Education Studies and the Institute of Government of the University of California, Berkeley. He has also been British Council lecturer at the University of Pernambuco, Recife, Brazil, and on several occasions a visiting professor in Japan, at the universities of Kyoto, Hokkaido and Kansai and at Hosei University in Tokyo. He has written articles in American, European and Japanese sociological journals, conducted a comparative study of telephone usage in Tokyo, Manhattan, Paris and London for NTT, and a study of British entrepreneurs for Ernst & Young. His publications include Revolution and the Making of the Contemporary Legal Profession: England, France and the United States (OUP, 2006) and Class Formation, Civil Society and the State: A comparative analysis of Russia, France, the United States and England (Palgrave Macmillan, 2008). He edited Martin Trow: Twentieth-century higher education: from elite to mass to universal (Johns Hopkins, 2010). His previous Civitas publications include Where’s the Insider Advantage? A review of the evidence that withdrawal from the EU would not harm the UK’s exports or foreign investment in the UK (July 2014) and ‘A club of high and severe unemployment: the Single Market over the 21 years 1993-2013’ (July 2015) in the Europe Debate series.